The 9GED21500-011 from Weiser lets you control who has access and when to your home using ZWave technology. This lock is a replacement model for the 9GED21500-006 which features extended battery life, over the air updates, faster communication (up to 240MB from 40MB) as well as a longer range of 80 to 100 feet. 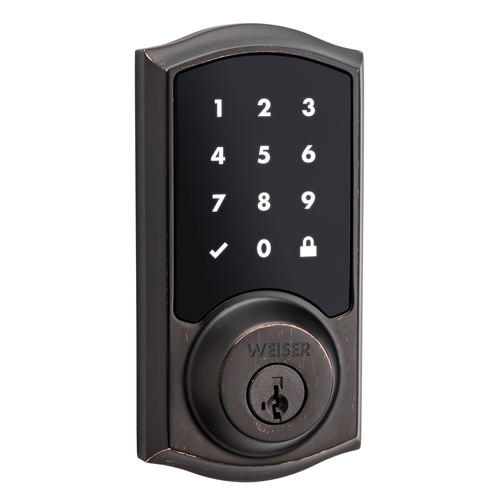 The Weiser Smartcode 10 Touch Zwave deadbolt features a quick one-touch lock, cool white LED display and quick detect of correctly entered codes for faster exit and entry. The interior size has been reduced dramatically compared with earlier versions. The SecureScreen™ feature when enabled will display 2 random digits on the screen that must be touched first before entering the user code. This ensures that the bad guys can't simply look for finger smudges to determine the commonly used codes. Up to 30 user codes may be defined. 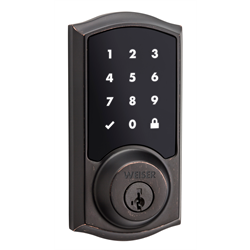 But the true beauty of this lock is unleashed by combining the ZWave lock with a compatible ZWave automation controller or security system to allow the lock to be locked and unlocked remotely, status checked, or even enable email or SMS notifications or alarm integration depending on the controller functionality. (controller/security system sold separately).